Karen Montero (far right) with her fellow camp counselors Erica and Tatiana. Karen Montero, the Interim Urgent Care Coordinator with Sutter East Bay Medical Foundation, recently spent a week volunteering at Camp Okizu, a free summer camp for children and families that have been affected by childhood cancer. Karen has been a cabin counselor two years running and she loves being able to supervise children while they participate in fun activities they normally wouldn’t be able to do. Each year, thousands of homeless and at-risk children in our local communities return to school without the basic supplies they need. Preparing these children for school with a new backpack filled with school supplies boosts their self-esteem and gives them the tools and confidence needed to learn and thrive in school. 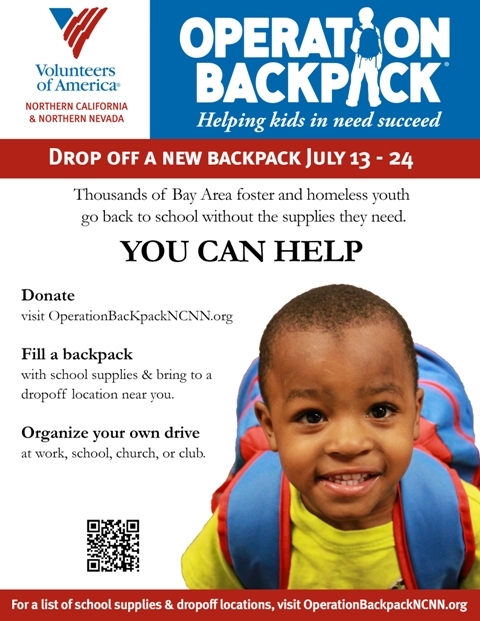 The SEBMF Orinda Care Center is collecting backpacks and school supplies for Volunteers of America’s Operation Backpack. Please drop off your backpacks and supplies by Friday, July 17. Our goal is to donate 50 backpacks! Here’s the Backpack Supply List. Click here to visit the Operation Backpack website. Or you can drop off backpacks directly at the following two official drop off locations between July 13-24. 628 Escobar St., Martinez CA 94553. Together, we can prevent – and knock out – diabetes! For additional information, call 510-869-8223. Register online by June 22. A morning shower in Pleasanton on April 25 couldn’t dampen the spirit of hundreds of walkers wearing Sutter Health’s colors in March for Babies, benefiting the March of Dimes. The “super team” of employees, friends and family members represented Sutter Health’s East Bay affiliates. The East Bay March of Dimes team raised more than $74,800 and SEBMF surpassed its goal by raising $10,448. Alta Bates Summit’s Comprehensive Cancer Center and the American Cancer Society support women during cancer treatment. Alta Bates Summit Comprehensive Cancer Center now offers a free wig and American Cancer Society consultation for women losing hair during cancer treatment. The wig bank is staffed by specially trained volunteers at the cancer center, 2001 Dwight Way in Berkeley. Call 1-800-227-2345 for an appointment.